Spring is finally here. That means warmer weather and beautiful hiking opportunities! We know you’re ready for some new adventures, like backpacking through the Redwood Forest or hiking the rocky trails of the Grand Canyon. 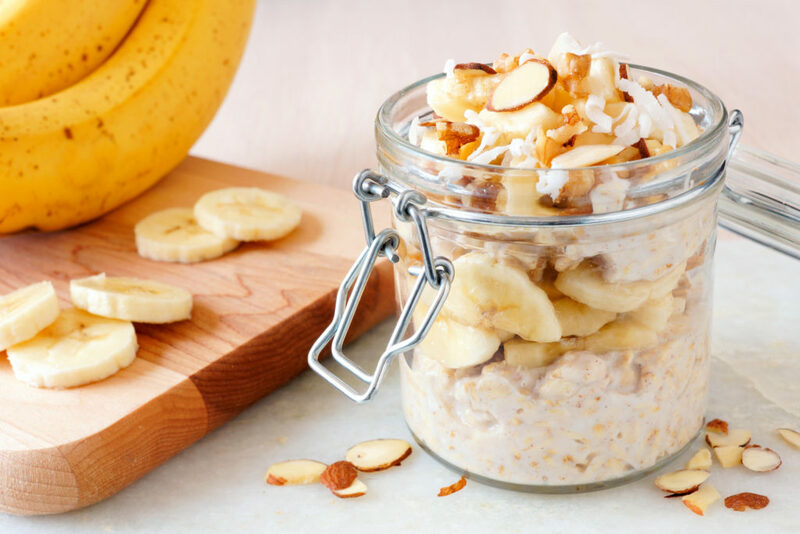 So, we’ve curated a list of some quick, easy and energizing power hiking breakfast recipes that are sure to get you pumped in the morning. 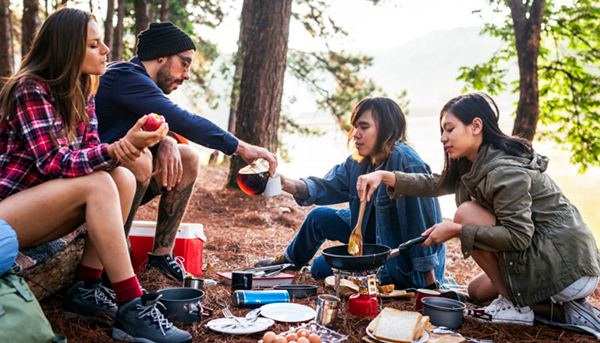 Whether you’re hiking up a mountain or to a waterfall, these hiking breakfast recipes are a fast and simple fix to start off your outdoor morning routine. Oatmeal has always been a traditionally simple, yummy and nutritional breakfast. This recipe adds peanut butter for some extra protein, flavor and crunch to get your day started. It takes only a small amount of ingredients and preparation. There’s also over 13 grams of protein in one serving. Just remember that you need hot water for this hiking breakfast recipe, as well as a bowl or jar that can withstand some hot, delicious oatmeal. First, mix the quick-cooking oats, full cream milk powder and cinnamon in a resealable jar while you’re at home. Pack the remaining ingredients separately to be added the morning of your hike. Once you’re on the trail, boil the ½ cup of water. Pour the hot water into the mason jar. Next, cover the jar and let stand for one minute. Then, stir in the peanut butter. Thinly slice the banana and add the slices on top of the oatmeal. Sprinkle the crunchy nut granola on top. Feel free to add blueberries, chocolate chips, nuts or dried fruit on top of your granola, too. Sounds yummy, right? 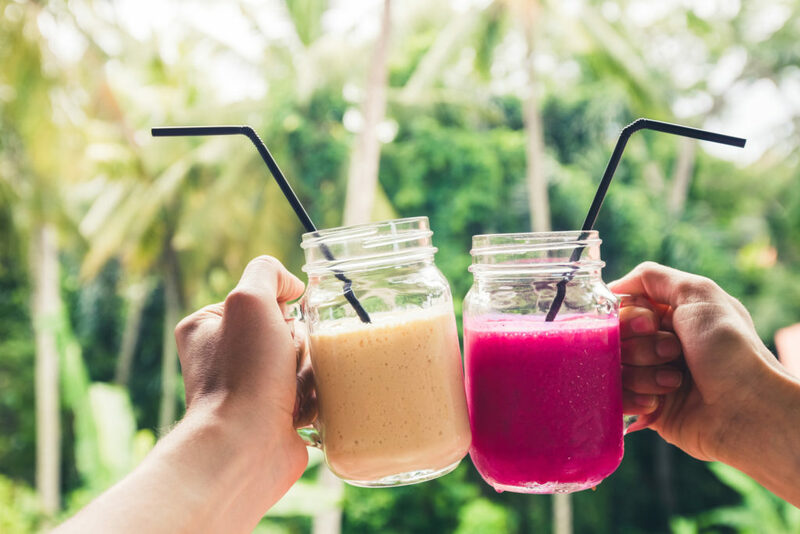 This delightful fruit smoothie is a lighter breakfast option that is still jam-packed with flavor. How many hiking breakfast recipes have 7 grams of protein and 9 grams of dietary fiber inside? It also requires almost no prep time and can be enjoyed at your campsite or on-the-go. You won’t even need to keep anything warm or refrigerated while you’re out exploring nature. At home, you can combine all the ingredients into a resealable drinking thermos or bottle. Before you start your hike, add the water to the bottle and shake well. Let the smoothie stand for at least five minutes to let the ingredients rehydrate. Then, shake again and drink up! Yes, some power hiking breakfast recipes require a little more gear and cooking at the campsite. 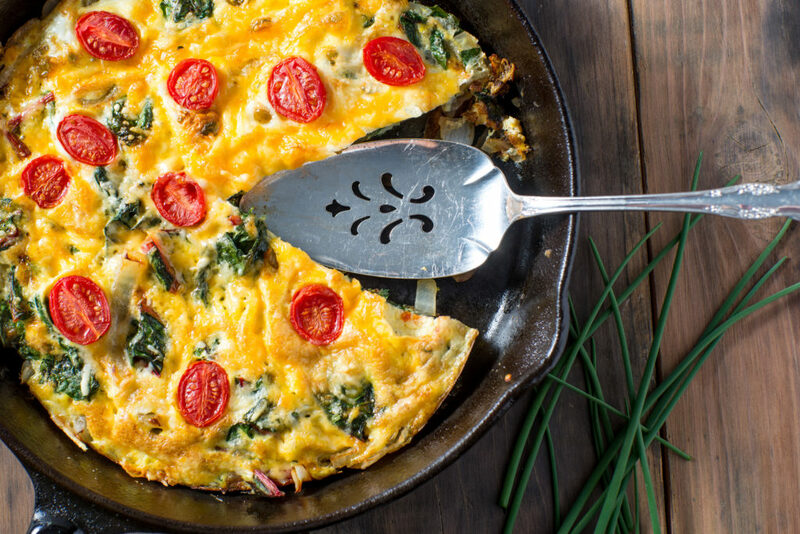 This is one of them, but don’t worry because you’ll be starting your morning off right with this delicious, hearty chorizo frittata. It contains over 30 grams of protein, less than 500 calories and it’s perfect before a long day of endless trails or uphill trekking. You can also add any extra vegetables or herbs to our recipe. Before you head out of the house, mix the powdered eggs, full cream milk powder, sun dried tomatoes and oregano in a zip-lock bag. Pack the rest of the ingredients separately. Once you’re on the trail, add the water to the zip-lock bag mixture and beat well with a fork. Add the salt and pepper to taste before setting the bag aside. Then, slice the chorizo and chop the onions. Melt the butter in a frying pan before adding the chorizo and onions. Cook until the onions are soft and then fold over the egg mixture. Cover everything with a lid and cook on low heat for about 10 minutes or until the center of the frittata is set. Then, slice or chop the heirloom tomato. Lastly, remove the pan from the heat and sprinkle the frittata with the tomatoes and Parmesan cheese. Take a bite of your mouthwatering breakfast! You won’t believe this 4-step recipe that requires no baking and produces 12 delicious granola bars. The granola bars are prepared at home, but will definitely be worth it out on the trail. You can eat a couple for breakfast and keep some for a snack throughout the day, too. They have 10 grams of protein each and are sure to give you the energy boost you need before a long hike. As far as power hiking breakfast recipes go, this one will last you all day. First, stir all the ingredients together in a bowl. Then, press the mixture into a non-stick 9 x 11 inch baking dish, using the back of a spatula to press the mixture into a flat, even layer. Refrigerate the mixture for at least an hour, preferably overnight. In the morning, cut the mixture into 12 bars before wrapping each granola bar individually in plastic wrap for storage. 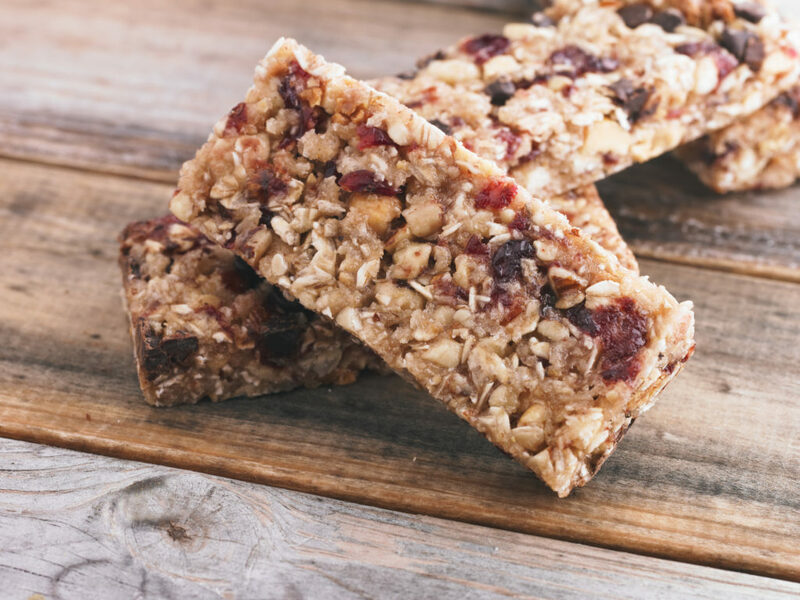 The granola bars are easy to pack and share, but after one bite, you’ll realize you want them all for yourself. You can’t go wrong with pancakes for breakfast. 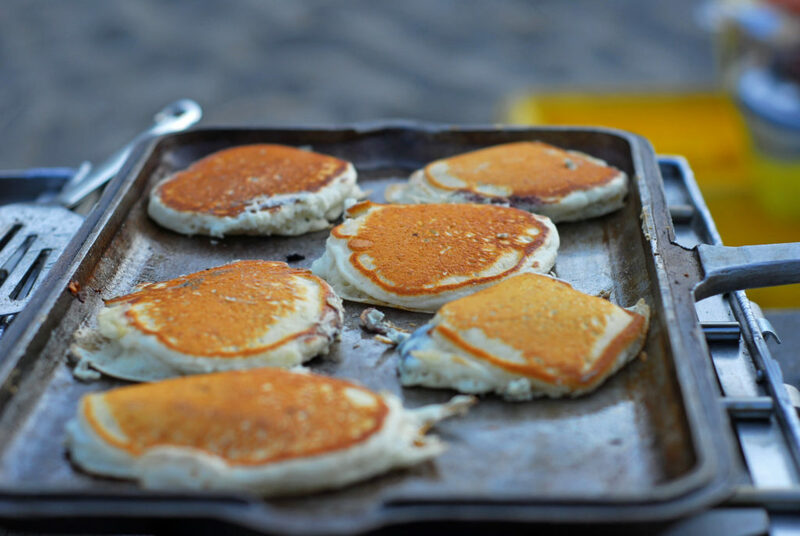 These oatmeal pancakes are packed with 11 grams of protein, less than 500 calories and are easy to make at your campsite. They taste great and don’t require any frozen or complicated ingredients. You can fry them up quickly, eat them even faster and clean up in no time! At home, mix all of the dry ingredients together in a zip-lock bag, not including the water and butter. Pack the two remaining ingredients separately. At the campsite, add the ½ cup of water to the bag mixture and stir until smooth. Then, close the bag and let stand for five minutes. Next, melt the butter into a frying pan over medium-low heat. Carefully cut off one corner of the bag with the pancake mixture and squeeze about 1 ½ tablespoons of batter into the pan. Leave the pancake on one side until slightly browned, then flip and cook until the other side is also slightly browned. Repeat for each pancake. Top with butter, syrup or fruit on top if desired. Enjoy your delicious pancake breakfast. Making an energizing breakfast doesn’t have to be time consuming or difficult. From oatmeal and smoothies to frittatas and pancakes, there are power hiking breakfast recipes out there for everyone. Each recipe can be altered to cater to the flavors and ingredients you love, as well as eaten for breakfast on any day you need a little energy boost or some extra protein. There are so many easy camping recipes out there. As they say, breakfast is the most important meal of the day!